“You’re going to love it, it’s pretty much an F-Type with four doors,” a Jaguar rep told me on the eve of my drive in the all-new 2017 Jaguar XE. I think he oversold it a bit. The XE is a competent and sophisticated sporty-ish sedan with some of the best technology in the industry, but it comes up a bit short on the driving dynamics that could make it a real and credible threat to the BMW 3 Series. Now, it’s probably not fair to compare the F-Type—Jaguar’s barnstorming, ear splitting two-seat grand tourer and a perennial Jalopnik staff favorite—to any kind of four door, five seat sedan. And the XE is a fairly sporting car. It just didn’t move the needle as much as I expected to. We’ve been seeing great things from Jaguar Land Rover lately and the XE is a pivotal car in the resurgent company’s lineup. 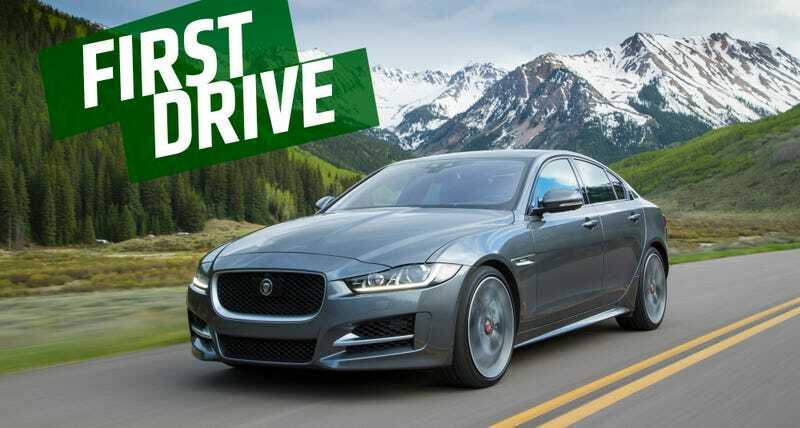 It’s Jag’s first real attempt (do these nice people a favor and don’t bring up the X-Type) at a “compact” sport sedan worthy of the 3 Series, the Mercedes C-Class, the Audi A4, plus recent players like the Cadillac ATS. I put that in quotes because none of these cars are that small anymore, but I’m not in charge of this stuff. Launched in Europe earlier this year, the XE is on sale in the U.S. market now with three engine choices: a 2.0-liter gasoline turbo four with 240 horsepower, a 2.0-liter diesel—yes, they still sell those here!—turbo four with 180 HP, and a 3.0-liter supercharged V6 with 340 HP. One thing we Americans will not get: a manual transmission option on any of the cars. They couldn’t make a business case for it, I was told. Once again the demands of Jalopnik’s comments section do not translate into real-world sales. A bummer, and another feather in BMW’s cap here. Despite what I’ve said so far there is much to like about the XE. By every measure it is a highly impressive car and one of the better alternatives to the existing players in the increasingly crowded sport sedan market. But it also misses the mark in ways that could make it the best out there. The XE is certainly handsome. It’s also boring—a bit too conservative and a bit too much like its bigger sibling the XF. It looks best from the front, where the curved headlamps, the rectangular grille and the prominent Jaguar cat logo make for a classy and tasteful look. Does it lack the visual drama of the F-Type Coupe, or even the XJ? Definitely. (Hot take alert: the F-Pace looks better too.) But this segment is infamous for being light on risk-taking; Audi phoned in the latest A4 so hard I considered emailing some folks over there to make sure everything was okay. The XE is designed for mass appeal and it works. Having said that, the car works best in more interesting colors and with darker wheels. One of our test cars was a British Racing Green variant as well. If you buy an XE, buy that one. It’s the right thing to do. On the inside, I’m happy to report that photos don’t do the interior justice. It’s elegant and modern inside, even a bit minimalist, keeping all the relevant buttons in a nice orderly array that’s easy to figure out. The seats are comfortable, sport and well bolstered, and offset with some nice accent stitching on several of our test cars. One downside was the hard plastic surrounding the center console; it’s something of a reminder that you didn’t spring for a pricier Jaaaaaag. And yes, the gears are selected with a rotary dial. Get over it. As my co-driver noted, it’s a wonder we haven’t gone entirely to buttons yet for automatic gearboxes. The new Jaguar InControl infotainment system is a huge win. Previously the system used on most Jaguars and Land Rovers was, to put it charitably, garbage; the replacement happens to be excellent. It’s situated in an optional, wide rectangle 10.2-inch screen offset by black piano plastic that is a delight to look at. Thanks to a new processor it’s incredibly fast, making scrolling through menus or finding a satellite radio station about as quick as you’d expect on an iPad or similar tablet. The menu layouts and graphics are all very pleasing and easy to figure out. With this, Jaguar joins Fiat Chrysler and Volvo as having probably the best systems currently on the market. Despite liberal use of aluminum, the XE is not as light as you’d expect. And I could feel that heft in the twisting mountain roads around Snowmass. The first car I tested, the supercharged V6 35t R-Sport (the XE S in other markets, which is a much simpler and better name) with all-wheel drive, came in at a beefy 3,795 pounds—75 more than a comparable 3 Series. A rear-wheel drive supercharged V6 XE wasn’t available to test here (but is available to you, the buyer) and the AWD neutered the fun considerably. It’s a wide car, or at least one that feels wider than some of its competitors on the road, and thus wasn’t as lively in corners as I feel like it should have been. And besides the general feeling of heaviness, it didn’t stay as composed over bumps as I would have expected from a car in this class. The worst part was the electronic power steering, which had a resounding numbness on center and lack of weight that translated into poor feedback. This was easily the most disappointing thing on the XE, and the thing that cut back on fun the most. Even though it’s the same ZF steering rack you get on countless BMWs and Cadillacs, the tuning here results in a car that lacks the playfulness of a 340i or the sheer agility of the ATS. And while the 340 HP supercharged V6 comes from the F-Type, it’s not as fully potent as many of Jag Land Rover’s other engines. Sure, it’s quick, and has a nice linear power delivery you don’t get from competing turbo motors, but it’s hardly overwhelmingly fast. Zero to 60 mph happens in 5.1 seconds. Later that day I drove an F-Pace S crossover with 380 HP from the same motor, and it felt quite a bit more lively, not to mention louder. The XE is also the least aurally pleasing supercharged V6 I’ve heard from Jag; at moderate throttle it just kind of drones, but the blower whine at high RPM is a nice touch. My kingdom for an active exhaust on this sedan! After finding the AWD V6 XE a bit wanting, I moved on to the real European car: the one with the diesel engine. Like the Td6 in the Range Rover, it shows how good modern oil-burners really are: it’s smooth, quiet most of the time, and its wonderful 318 lb-ft of torque provides ample oomph from down low. Granted, it runs out of breath as it approaches that 5500 RPM redline, and with a zero to 60 mph time of 7.5 seconds it’s not at all quick, but it moves just fine. More than that, this car was simply more fun to drive than the 35t—but not because of speed. This rear-wheel drive model boasted vastly superior steering rack tuning that had more of the heft and directness lacking from the other model. I felt more in tune with the car as I powered it through these Colorado mountain roads, more in control of any tail-out antics that I might want to happen. With the significant difference in steering quality, the rear-drive model emerged as the winner. Lesson learned: if you’re buying a Jaguar XE, skip the AWD. Will Jaguar be able to sell any diesel models to Americans? I can’t really say, but I have a hard time seeing the appeal given the current climate. A Jaguar rep said this diesel allows them to “tell [their] own story,” which is presumably not a story about egregious emissions cheating. Its fuel economy also has yet to be rated by the EPA. On both models, fortunately, the ZF 8-speed automatic continues to be a delight, providing fast and smooth shifts on its own or when the paddles are used. The brakes, on the other hand, left a lot to be desired. They faded early and often and left a nasty smell in their wake, and while my co-driver and I gave these cars a solid backroad workout, it was nothing on the level of a couple laps around a track or some autocross—you know, things sport sedans might be used for. Without question, the XE is a solid offering from Jaguar. But at least from the cars offered for testing here, in the area of pure driving fun, it isn’t quite the best in the segment. On those roads in Colorado, I couldn’t help but think I’d rather be in a 340i or an ATS instead. The XE starts at $34,900 with the turbo gasoline four. Like the rest of the cars in this segment, you can easily nearly double that with options and fancier engines. The XE 35t R-Sport with AWD I tested came in at $61,385, and the 20d Prestige RWD diesel came in at $52,985. I am eager to try the supercharged V6 with rear-wheel drive, as well as the gasoline turbo four option, which seems intriguing on its own. Hopefully either of those will emerge as the driver’s choice, because there’s a lot to like in most other aspects. More than anything, the XE should provide Jaguar with a good platform to play with. Bring on the R model, with better handling and more power, or ideally the SVR one done up Jag’s top go-fast scientists and ready to do battle with the M and AMG sedans of the world. Then we’ll be paying attention.